In his first full year with Oakland, Josh Donaldson has shown what he can give the club. Time after time, the third baseman has delivered clutch, run-scoring hits in crucial situations that helped propel the Athletics to first place at the All-Star break. Donaldson has also shown what he can take, namely, Oakland’s notorious clubhouse antics. The Athletic dressed up in a wrestling costume in a rookie initiation ritual and agreed to photocopy his rear end in a television commercial. In particular, Donaldson has endured in good humor a steady stream of whipped cream pies to the face delivered by teammate Josh Reddick. Donaldson, 27, wasn’t always so comfortable in Oakland’s clubhouse. And the more he opens up his personality, the more he seems to produce for Oakland. Donaldson delivered a torrid first half and led the club in hits, batting average, on-base percentage, homers and RBI at the All-Star break. Explaining the club’s success so far this year, manager Bob Melvin pointed to Donaldson immediately. Before he faced off against major league hitting, Donaldson faced a difficulty in his Florida upbringing. His parents divorced when he was still a toddler and his father later landed behind bars on domestic violence and drug charges. Lisa French, Donaldson’s mother, raised him alone. Playing ball from the age of five, he developed a competitive streak early, his mom recalled. “Josh was a very active child. Our life revolved around whatever sport he was in. Every vacation we took had to do with baseball,” said French. “I don’t think he played anything that wasn’t competitive, even Nintendo. I don’t know how many controllers I bought because he’d lose a game, throw them at the t.v. and break them. During high school at Faith Academy in Mobile, Alabama, Donaldson excelled in baseball as well as football and basketball. As a senior, he hit .515, was named an all-state pitcher and shortstop and set a school football record with 11 interceptions. He graduated in 2004. Now with the green and gold, Donaldson enjoys celebrating big hits with a shout or a fist pump and declared himself “king of the world” when he won a player of the week award in April. But he’s also modest, approachable and quick to deflect credit and praise toward his teammates. College ball helped him to mature, he said. Donaldson attended Auburn University in Alabama on a baseball scholarship. “They made me an offer I couldn’t resist,” he said. During his freshman year in 2005, he made his first appearance as a pitcher, hurling two scoreless innings, before settling in at third base. Donaldson hit .294 and made the NCAA All-Region team as the Tigers advanced to the Southeastern Conference tournament. That turned out to be the team’s most successful year during Donaldson’s time at Auburn. “There weren’t a lot of good memories in my sophomore year,” he shared about the 2006 Auburn Tigers. “We broke a school record for losses.” The team continued to struggle in 2007 even as Donaldson developed as both a third baseman and catcher. But he learned from the difficulties, he said. That attitude helped sustain him during emotionally trying early days as a pro. Expecting a first-round selection, Donaldson was somewhat disappointed to be the 48th overall pick by the Chicago Cubs in 2007. Struggling on Chicago’s Class-A affiliate in Peoria, Illinois in 2008, the future big league star overcame another moment of doubt. His mom never doubted that baseball was his passion and his future. “I don’t recall Josh ever saying he wanted to be anything but a pro baseball player,” she said. 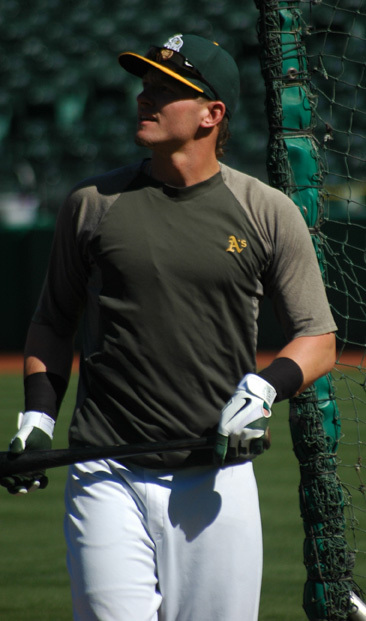 Traded to the A’s in 2008 in the Rich Harden deal, Donaldson first made the big club in 2010, filling in for injured catcher Kurt Suzuki. He smashed a two-run homer for his first hit to help the A’s beat the Blue Jays. “My debut as a starter was awesome,” he recalled, and it didn’t take the club long to introduce him to Oakland-style baseball fun. After he trotted the bases, the club gave him the silent treatment in the dugout. “The first hit wasn’t necessarily hard for me,” he said. “It was the second hit.” Donaldson’s first big league cup of coffee lasted 14 games and he wouldn’t don the green and gold again until 2012. Last year he made the trip between Sacramento and Oakland several times, again leading him to doubt his future only to rebound with the patience and determination he’d developed along the way. Following the injury to third baseman Scott Sizemore, the club moved Donaldson to the hot corner. There he turned himself into a fielding machine, once starting a triple play. Meanwhile he developed a knack for smashing big hits that helped fuel the playoff drive, including a four-for-four effort against the Indians. Defeating the Texas Rangers on the last day of the season thrilled the young Athletic. This season Donaldson has developed into a Gold Glove-caliber third baseman. “He’s really nailed down the position,” Melvin said. His favorite defensive highlights include an over-the-tarp grab against the Cardinals and a diving catch to steal extra bases from the Giants’ Buster Posey. But it’s his seemingly endless supply of clutch hits, like his 12th inning, walk-off homer against the Tigers in April, have gained him the most attention and All-Star consideration. Give the team a big hit, take a pie in the face. True to form, Reddick nailed him after the game. “He’s been absolutely amazing for us at all times and especially at clutch times in each game,” said second baseman Eric Sogard. Like a true Athletic, Donaldson found a way to repay his coaches for their kind words. An avid collector, the third baseman bought baseball cards of his coaches’ playing days, brought them to work and read their statistics aloud to them. Melvin, Davis, Mike Gallego, Billy Beane and the others didn’t all relish the experience, he said. “Maybe they don’t like all of their numbers,” he laughed. But Donaldson proved his hitting coach’s comments correct in the July 14 game against the Red Sox which finished the first half of the season. Donaldson had had a forgettable night in the series opener, going zero for four with a strikeout and a rare throwing error. Shaking it off, he spent extra time in the batting cage the next day. In the finale, Boston’s Brandon Workman took a no-hitter into the seventh. Then Donaldson drilled a home run 438 feet to left, tying the game. Batting in the 11th, the third baseman muscled a ball the other way to right, knocking in the winning run and sending Reddick after the whipped cream yet again. The crowd went nuts. Donaldson’s play is thrilling A’s fans and none more so than his biggest fan. “I’m absolutely loving it every single minute of it. I’m just amazed. Every time I see him on t.v., I think, ‘That’s my baby!’” French said. “Are you ready to win?” third baseman Josh Donaldson asked his young partner loud enough for their opponents and spectators to hear. At the annual A’s Community Fund Golf Classic, Oakland’s star infielder showcased both his putting prowess and his personality for charity and for fun. Golf is nothing new to the slugger who’s carried Oakland’s offense this season. “It’s one of my favorite hobbies,” Donaldson said. “My dad got me into it real early. I actually started playing when I was about 18 months old.” In fact, his youthful ability drew comparisons to Tiger Woods, media attention and even television cameras. Donaldson’s parents divorced before he reached school age, and when his father left his life, golf did too. Donaldson plays for fun and has occasionally competed tournaments near his Alabama home. He also competes against his coaches and teammates now and then at his favorite local course, Boundary Oaks in Walnut Creek. At the team’s charity event at Round Hill Country Club in Alamo, Donaldson and his young partner Haley Ali lost the putting competition despite the infielder’s trash talk. Catcher Derek Norris and his teammate took the crown.